The Communicated Stereotype » NYPD Trained To Stereotype Muslims? Is the NYPD Racist? The police have a bad reputation for being racist. In a hysterical seven minute video, Michael Moore demonstrates this adeptly. There is even a book about it. Since the terrorists attacks of September 11th, criticism of the police for racism against Muslims, in addition to the longstanding stereotype of cops as racist against blacks, has been visible as well. For example, on August 30th an incident at Rye Playland began when a Muslim woman and cops argued over her right to wear a headscarf or hijab on a specific ride and ended with several people being arrested and several people were injured including two park rangers. Perhaps just as much as the stereotypes of Muslims as racist might have prompted racism in this case, it is likely that the stereotype that cops are racist worked against the situation as well. This is in part because people use meta-stereotypes. Meta-stereotypes are a person’s belief about the stereotypes that others hold about that person’s group. So, if the woman in the park held a meta-stereotype that the cops would stereotype her as a dangerous Muslim, then she might have behaved in an antagonistic way that might have prompted the cops to act negatively towards her. In addition to meta-stereotypes, the recent news about the New York City Police Department training doesn’t help dispel the stereotypes that cops are racist. Although not sanctioned by the higher ups in the NYPD and city administration, media outlets like The Wall Street Journal reported that new trainees were being shown a film that provokes and promotes anti-Islamic stereotypes. According to The Wall Street Journal, “The police department said it was played in a continuous loop in the sign-in area of counterterrorism training sessions between October and December 2010. As many as 1,489 trainees may have seen the movie, according to documents released under New York’s public records law.” The trailer for the movie called The Third Jihad is available here. The full film is available here. So the NYPD is not helping to discredit the stereotype that police are racist. At the root of this circular stereotyping is the concept of framing. Framing suggests that our interpretation of an event is in part determined by how and when we think it began and ended. For example, if I tell you imagine a beautiful sunset on a beach. You can imagine it. You might even momentarily feel like you are there. You might wonder when you can make a trip to a place where you can see a sunset like that. If you have the resources, you might even call a travel agent to start planning the trip. But if I tell you “imagine a beautiful sunset on a beach” and add “hanging in a picture frame on the wall of a room” the image this invokes is rather different. The emotions and thoughts probably are too. Instead of thinking about taking the trip you might think of something you wanted to frame in your own home or you might think of a friend or family member who has a similar image hanging in their home. From this example, you can imagine that the way we frame the messages that we communicate matters. This framing determines where we place blame and try to answer that question of who started it. As long as we think the other person started it, then we scapegoat them and we can alleviate any ownership we should have over the messages we communicate. My favorite example of this in media is in Beauty and The Beast when Belle is cleaning the Beast’s wounds after he saves her from attacking wolves. Beast: Well if you hadn’t have run away, this wouldn’t have happened. Belle: If you hadn’t *frightened* me, I wouldn’t have run away! Beast: Well *you* shouldn’t have been in the west *wing*! Belle: Well, *you* should learn to control your temper. Now, hold still. This might sting a little. Beast: [stops growling] You’re welcome. Some will argue that the police wouldn’t have to be shown videos like this in training (link to video or trailer) if there weren’t Islamic jihadists out there trying to kill Americans. Others will argue that it is this is further evidence that cops are racist. Some will argue that the police were just doing their job in Rye Playland when they made the arrests. Others will argue that if the police weren’t racist the incident never would have escalated. Ultimately, it is a matter of framing. The problem is that with chicken and egg arguments, no one ever wins because there is no right answer. Intead, everyone loses. The police aren’t being racist, they are simply taking precaution. It is much better to be safe than have another terrorist attack similar to 9/11. Unfortunately profiling is something that cannot be avoided in a sticky situation such as this. I agree that some cops are racist, not all though. I think if you talk to many African Americans or Muslims, that many will say that they have been racially profiled. For instance, one time, I was driving back late one night, when I was pulled over. I was not doing anything wrong, but the officer was just stopping us because we were near a bar. I am a white female but when the police man noticed that my passenger and friend was black, he became very suspicious. He kept asking us if we were up to anything but he was only looking at my friend. He would not stop badgering my friend. 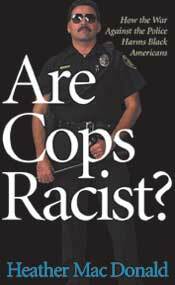 In regards to Muslim racism, I think that directly after 9/11, so many people were racist, including cops. I think that many people were so frightened for their safety that they were very rash. I was in 4th grade when 9/11 happened and I will never forget how lost and confused I felt in chaos. All of my peers were being picked up, and everyone looked so worried. I remember that a few boys and girls in my grades were actually shunned because they were Muslim. Some of the kids in my grades heard from their parents that Muslims were bad, and that they should not play with them. I guess I shouldn’t be surprised that Muslim racism is still around and that typical Muslims are often thought to be associated with the radical Muslims, but I am disappointed. IT is just so unfortunate that many people don’t think logically or rationally in judging an entire people based on a few radical ones. I realize that the fear from 9/11 was so traumatic that it will be ingrained in everyone’s mind from this generation. From a psychological perspective, thoughts based on fear are much more strong and long lasting. I am not opposed to random searches because it is likely that either someone will be found with an item which they should not have had, or at least some people will be less prone to carry such items because of the possibility that they will be searched. However, I must wonder why such an uneven number of those who are randomly searched are not white. I am uninformed as to whether the cops themselves are racist of whether their superiors are the ones who tell them to search people who are not white. Regardless of from whom the command stems, there is some racism afoot; there is no debating such a statement when ninety percent of the people who are randomly searched are not white. After reading the points presented in this article, I do not believe that the NYPD is racist. Pertaining to the first example of the woman being asked to take off her hijab, I find that the police were just trying to do their job and keep everyone safe on the ride. I do not believe that they were specifically attacking the woman, also proven by the fact that they informed the group putting on the event numerous times about the safety precautions. In regards to the second example, though the video may have been inappropriate in some situations, it was shown in a counterterrorism training session. I believe that the video was shown in appropriate terms because, though they are not the only ones who have followed through with terrorist attacks on the U.S., it was Muslims who were responsible for the September 11th attack. I believe that sometimes there are inappropriate stereotypes on Muslims, certain cases are blown out of proportioned and marked as “stereotypical” when truly there are not, as in these two situations. I was not aware that “Muslims” were “responsible for the September 11th attack.” Considering that a CNN report (available at http://articles.cnn.com/2009-10-07/world/muslim.world.population_1_god-but-god-middle-east-distant?_s=PM:WORLD) notes that 1 in four persons worldwide are Muslim, this seems to cast a rather wide net about who to blame for the September 11th attack. We could narrow it down to Muslims in the Middle East. But, still too wide. Muslims in a particular country. But the terrorists were actually from multiple countries. Certainly all citizens in those countries are not terrorists though they may be Muslim? So we cannot say “Muslims” nor locate a single country to blame. If we proceed to narrow down who we mean by “Muslims” further in the comment by KS, it becomes a slippery slope that will eventually lead you to determine that a small group of radical terrorists were responsible. If that’s the case, then a video indicating Muslims are dangerous would detract from finding the particular types of radicals that are involved with this sort of terrorist activity. It is much harder for the police to be suspicious of Muslims than it is for them to be suspicious of a small group of terrorists. However, if they are primed, such as in the video, to be wary of Muslims, then 1) there is a missed opportunity for them to be informed about the specific terrorists that are threats and 2) they might be so focused on the Muslim population at large they may overlook the specific group that is a threat. Would you assume all priests are responsible for child molestations? Would you assume all gun advocates were responsible for the Oklahoma City bombing? Are all pro-lifers responsible for the Atlanta Olympic bombing?